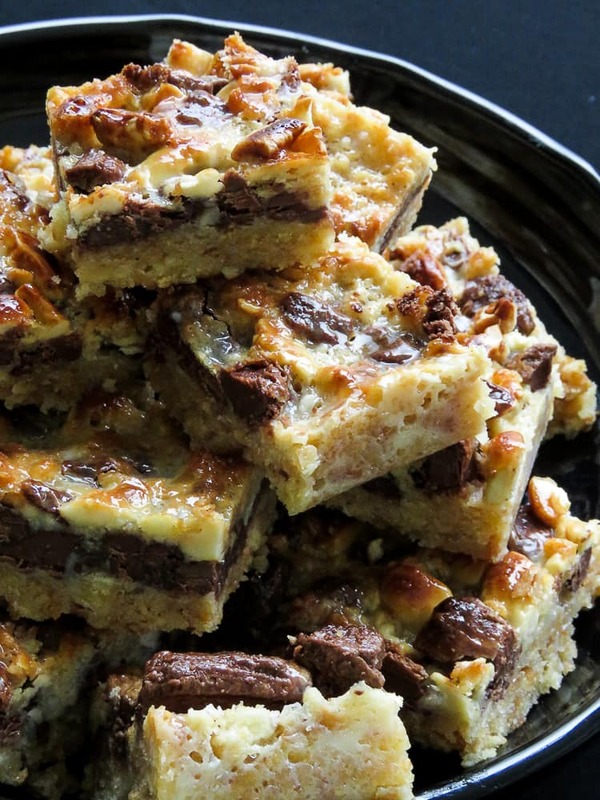 Chocolate-Cashew nut layer bars, it’s the easiest, five ingredient dessert bar you can make. a luscious, sweet and crunchy bar you’ll want to have in your favorite recipe list. 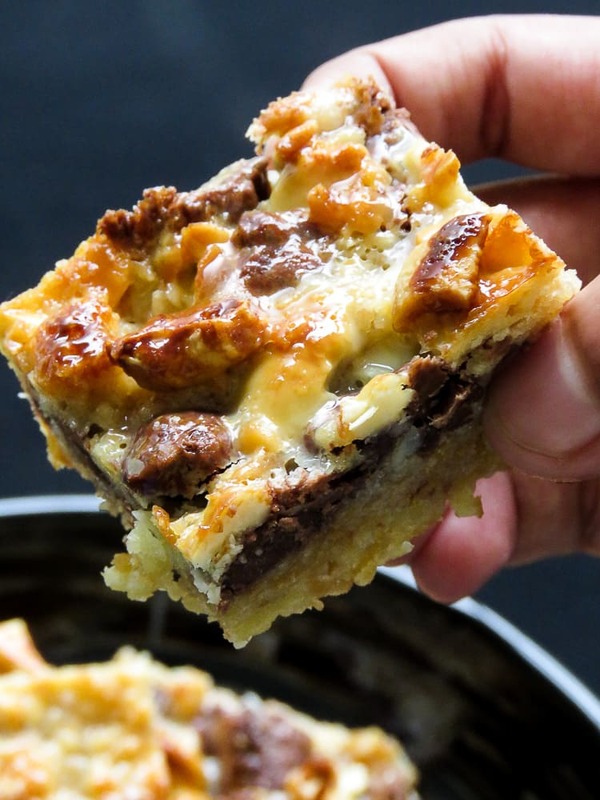 Layers of crackers , chocolate, your favorite nuts and thick condensed milk poured over then baked,cooled and cut into thick bars of extra sweet decadence. I’m probably praising these dessert bars too much but one bite into them, and you’ll know why. There’s a reason they are called “magic bars”(among many other names), not only are the bars easy to make but these will become your favorite one bowl recipe to make at any time you get the need to have something sweet. 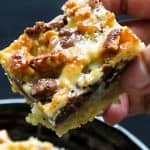 There’s a reason why you’ll find these layer bars or a variation of it in most popular food blogs, not only do they become popular with most readers but they become a favorite of the food bloggers as well, these have become my favorite dessert bars. I even skip the usual bake sale favorite cupcakes and make these Chocolate-cashew nut layer bars for my kids. You can freeze them, you can make them a day ahead, you can also get the kids involved as a fun kitchen bake off. for those of you who have regular guest the layer bars are a real time saver. For more recipes like this Chocolate-Cashew nut layer bars . Remember to subscribe to islandsmile food blog and get your fix and helpful recipes for your family delivered to your inbox. You can also find and follow me on Facebook, Twitter, Instagram and Pinterest. 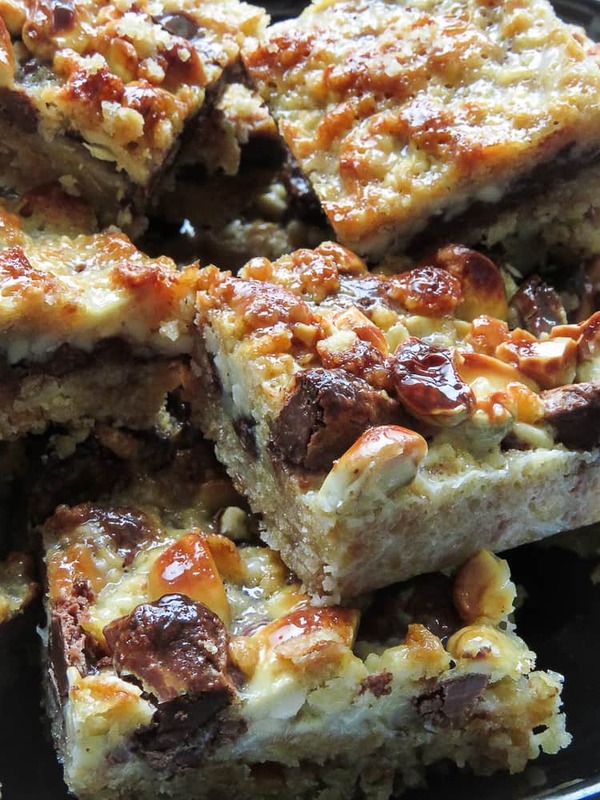 Recipe – Chocolate-Cashew nut layer bars. A few things to keep in mind making Chocolate-Cashew nut layer bars. To readers from Sri Lanka, the ingredients I use are local and can be found in any supermarkets. 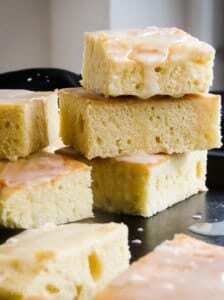 The bottom layer is made of local buiscuits, they are the square one’s you’ll find at stores. (apologies, can’t name the brands). To keep it budget-friendly and ease of finding ingredients, instead of chocolate chips, I’m using cooking chocolate slabs roughly crushed, I’ve kept the chocolate pieces slightly large, this is my personal preference. I like biting into pieces of chocolate, I like textures but you may not, if so replace them with chocolate chips. 1/to bake the crust for 8 minutes then leaving it to cool. 2/Before cutting them into bars, you need to refrigerate the bars for at least 1-2 hours. Instead of Cashew nuts, you can add your choice of nuts or maybe a mix of it? Some of you might find the bars too sweet, keeping this in mind I would suggest cutting the bars into smaller squares. Preheat oven to 350 degrees F(170C) . Use a 8 or 9 inch square baking pan, line the dish with the Aluminium foil and butter it. Microwave the butter for 20 seconds to melt it. Pulse the graham crackers until they are crumbly, make sure not to pulse until they become too fine. Transfer the cracker crumbs into a bowl, pour in the oil and sugar, mix well. Spread the crumbs evenly on the baking dish and press the mixture firmly into the pan. Bake for 8 minutes over 170C. once done, let it cool for a few minutes. Sprinkle the coarsely chopped chocolates over the pressed crumbs. Layer a thin layer of crumbs over the Chocolate. Sprinkle the Cashew nuts over the previous layer. Gently pour in the Condensed milk evenly and let it settle into the layers. 1-2 minutes. Don’t mix in the ingredients together at any point of the process but let the layers be as they are. Place the pan in the preheated oven and bake for 20 minutes over 170C. Once baked, remove from oven and leave it to completely cool. place it in the refrigerator for 1 hour for this purpose. Remove from the baking pan and cut into desired size. Transfer the cracker crumbs into a bowl and pour in the oil and sugar, mix well. Add a thin layer of crumbs over the Chocolate. Gently pour in the Condensed milk evenly and let it settle into the layers. 1/To readers from Sri Lanka, the ingredients I use are local and can be found in any supermarkets. The bottom layer is made of local biscuits, they are the square one’s you’ll find at stores. (apologies, can’t name the brands). 2/ To keep it budget-friendly and ease of finding ingredients, instead of chocolate chips, I’m using cooking chocolate slabs roughly crushed, I’ve kept the chocolate pieces slightly large, this is my personal preference. I like biting into pieces of chocolate, I like textures but you may not, if so replace them with chocolate chips. 4/Instead of Cashew nuts, you can add your choice of nuts or maybe a mix of it? 4/ Some of you might find the bars too sweet, keeping this in mind I would suggest cutting the bars into smaller squares.